Rita Samaan is an associate in Dykema's Bloomfield Hills, Michigan office. Ms. Samaan focuses her practice on litigation matters. 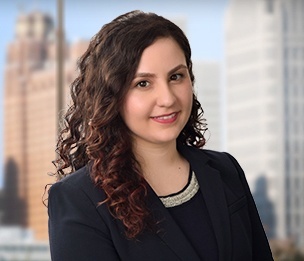 At the University of Michigan Law School, Ms. Samaan worked as a student attorney in the Pediatric Advocacy Clinic and Unemployment Insurance Clinic. Ms. Samaan represented a client in a guardianship trial in the Pediatric Advocacy Clinic and won. During Ms. Samaan's time as a student attorney at the Unemployment Insurance Clinic, she testified before the Michigan House of Representatives in favor of reforming Michigan's unemployment insurance program and worked on drafting new legislation, which was passed shortly thereafter. In addition, Ms. Samaan was a volunteer student attorney for the Human Trafficking Database Project and the International Refugee Assistance Project. Ms. Samaan also served as a Contributing Editor for the Michigan Journal of Race and Law.